Fruitive always has a rotation of house-made snacks and desserts available in our store. These treats are made from fresh fruits, vegetables, whole grains, legumes, nuts, seeds, herbs, and spices. From gluten-free cookies to raw cheesecakes, from kale chips to granola, we have a little something for every health-foodie and dessert-lover alike. These coconut macaroons are raw, gluten-free, and obviously coconut-dense! They’re sweet, creamy, and nutritious. Lightly sweetened with natural, low-glycemic sweeteners, as well as memory-enhancing cinnamon and nutmeg. Let these coconut delights transport you to a tropical paradise! These coconut macaroons are full of dietary fiber and provide a great energy boost. We understand that coconut meat and coconut oil are known for their scary saturated fat content, but, unlike most saturated fats, which are long chain fatty acids, coconuts’ saturated fats are medium chain fatty acids. Medium chain fatty acids are easier to break down, and may not contribute to high cholesterol levels – a common misconception about coconuts. So, enjoy these delicious raw delights, and thanks to the high levels of fiber, you may actually feel full before you overindulge! Kale is one of the best nutritional powerhouses available! We wanted to harness their goodness by offering you one of the healthiest, low-calorie snack foods out there… kale chips! We start with curly kale and mix in a nutritionally dense dressing consisting of nuts, seeds, veggies, herbs, fresh juice, and spices. To keep them as raw as possible, our kale chips are dehydrated, never fried or baked, in an effort to keep all the nutritional enzymes intact for your ultimate healthy snack experience. 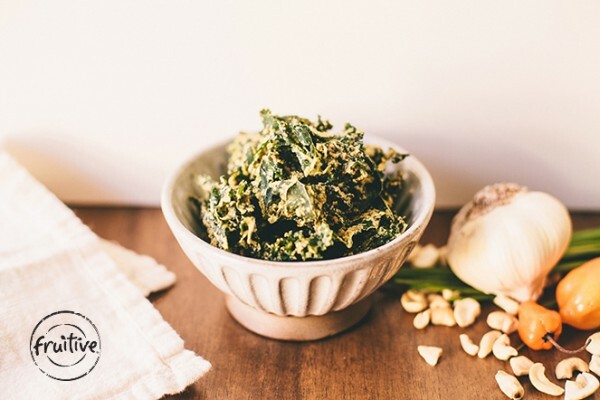 Specifically, our Zesty Ranch Kale Chips are creamy, savory, and, of course, zesty! The nut-based dressing that tops this flavor is similar to our homemade ranch dressing, yet it’s lighter and a tad spicier thanks to the added bold flavors of the fresh habanero. Watch out taste buds, because you’re in for a treat. Kale contains rich levels of vitamins A, C, and K, as well as 45 different flavonoids, making them true antioxidant powerhouses! These rich leafy greens are so nutrient-dense we like to think of them as our all-encompassing healthy greens. Why, you may ask? Well … kale supplies so many health benefits it’s hard to keep up: extraordinary anti-inflammatory and cancer-fighting properties, immune support, strong detoxifying and blood purifying properties, and so much more. Additionally, to get a cheesy, savory flavor, we use nutritional yeast, which is pack full of folic acid, protein, and B-complex vitamins. We’ve been told that our granola can’t be beat! It’s house-made, gluten-free, and super delicious! It is sweetened solely with applesauce, agave and a touch of coconut sugar, giving each half-cup serving only 6 grams of sugar – giving you just the right amount of energy without the unwanted sugar rush or empty calories. We are proud to say that our granola is not full of fillers like many other granolas, the ratio of nuts and seeds is higher than that of rice cereal and oats. Our granola is packed with protein – and yes, it’s sweetened – but not like your typical granola. It’s sweetened with healthy, natural sugar! 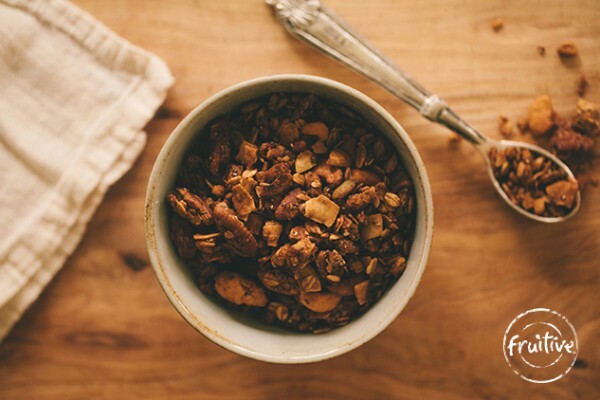 Oftentimes, health-conscious eaters are afraid of granola due to the high sugar content in combination with the high fat content – but not all sugars or fats are created equal. Not only is our granola naturally sweetened, but it’s also filled with protein, fiber, and heart-healthy omega-3 fatty acids from the seeds and tree nuts.